I have to say, the Auto Stock system in Pocket Clothier is not making much sense to me. 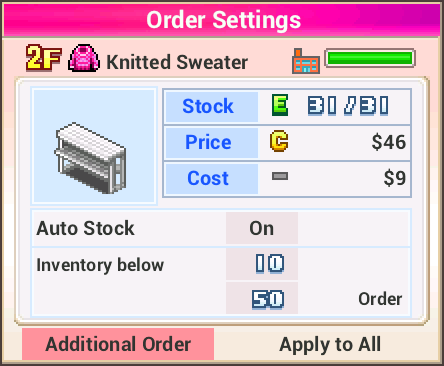 Now, you get taxed in 3M if you have more than $100k, and have any items that reaches over 100 pieces in shop + stock. I don't like the way it is. It means the game is a little not well thought. I tried manual ordering but it's just too much trouble. HOWEVER, if you are sick of trying to avoid tax, like me, you might want to look at how to make big monthly profit to pay tax. Check this out : Who Cares about Tax? Hmm What is 3M though, guessing month 3, the first time I read this I thought woah 3M as 3 million. But I am guessing its month 3. How do i find the order setting? On the main screen, swipe left to right ( or tab the left side of your screen near the edge ).